All images are Copyright Protected and the property of Jamie Williams Grossman. Paintings and photos displayed on this site may not be reprinted, copied, downloaded, displayed elsewhere, or used for any reason without her written permission. "OMGGGGG, Jamie!!!! It's absolutely amazinggggggg!!!!!! I loveeeeee it!!!!!! This is sooo much more than I could have imagined!!! Thank you!!!!" "It's spectacular, Jamie!!! How talented you are! We absolutely love it! And you are right-the frame is just perfect for it! " "Happy" with it is an understatement! My sister's husband said, "Wow, it's beautiful!" That's a lot of emotion coming from him! haha. And my adult daughter said, "OMG MOM, ITS GORGEOUS!". You have added to your fan club! "Jamie, your painting arrived in perfect condition! And, as I expected, it looks even better ‘in person’ than on the computer screen. Thank you so much for your careful packing and wonderful painting." "...Today I finally surprised [my wife] with the actual painting! It is her birthday! And I just wanted to let you know the we both absolutely love it!! She was so so surprised, and just speechless.... Thank you again for being so flexible and good to work with! It was such a joy preparing for today and I appreciated your professionalism throughout the process!" "I love the new painting! It's actually a little more golden and fluid than it looks in the pic and I love the movement; everything in my house is a little on the warm and yellow and gold side so it could hang pretty much anywhere. It's going to the framer shortly and I look forward to having it up :-)"
"Jamie, it's lovely!!! Thank you so much for all the time and love you've put into it! You have no idea how much joy your work is bringing to me. I'm very grateful!" "I just wanted to share that my father-in-law absolutely LOVES your painting. He loves the frame and said that he's never owned a real oil painting. 😊 But most importantly, he loves the subject matter and he and my husband spent a lot of time reminiscing this morning about hikes they took there years ago. This part of the Hudson is, by far, their favorite! Thank you SO much for making this Christmas gift PERFECT." 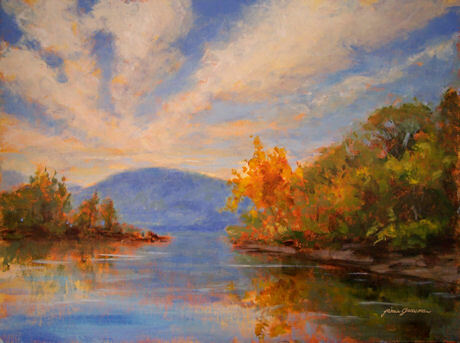 "Your paintings of my beloved Hudson Valley are stunning! 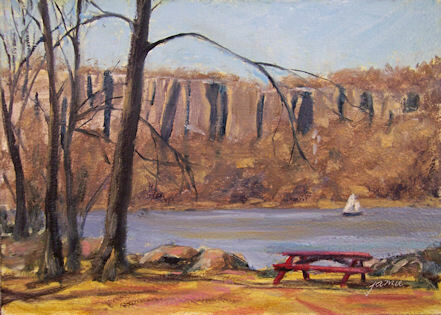 I've always loved Hudson River paintings, and can't believe that I've found someone who is following in the great tradition of Cropsey and company! " "We received your painting yesterday and it's really very beautiful. Thank you again very much." "Your beautiful "Autumn at Rockwood" arrived in perfect condition two days ago. It is even more lovely in person than I ever could have imagined. Thank you so much for your artistry and your many kindnesses to me..... I will treasure both of my paintings very much ..."
"I'm more than happy, I'm thrilled!" "I just wanted to let you know that I received [the painting] today! It is beautiful, thank you so much:)"
"Your [miniature] Caillebotte arrived today. Wow, it's WAY better seeing it in person than viewing an image/photo of it. Spectacular..... Thank you so much!!" "It's beautiful. Thank you so much!" "Oh, Jamie! It is fabulous!!!!!!! I love it!" "Hi Jamie, I received painting yesterday. It's really beautiful! Thank you for sending so quickly. I'm sure it will give my friend hope and strengthen as she faces this battle with Parkinson's. Thank you!" "Jamie, My painting arrived Thursday and I love it. I will definitely order from you again." "[They] love the painting. They were so surprised. They really appreciate it and the thought and artistry behind it. They received many [wedding] gifts, and said this was one of their two favorites." "[My husband] loved loved loved the painting! It is hanging on the wall in my great room. It's just beautiful!" "Hi Jamie! The beautiful paintings arrived safe and sound this afternoon. I love them! (Boy you don't mess around with packing them ;) Thank you." "Hi Jamie –I thought you’d enjoy seeing “The Red Barge” framed. Until I give it to my husband on his birthday, I have it hanging in my office. I LOVE looking at it all day!" "I received the painting this morning. It is SO FANTASTIC!!!!!! I wish I would have had it done larger. Thank you! thank you!" "The East from Hunter Mountain painting arrived the other day. It made it through the snow and looks great. Thanks for everything." "Jamie, my wife and I love it. Thank you and great work. It was difficult trying to figure out a special gift for them......I'm very happy that I reached out to you. I know they will love the painting and the special touch you did with the card! " "Wow, it looks AMAZING! They are going to love it. I love the name too. Perfect. ... Thanks again!" "Your lovely painting of a sweet bird, framed beautifully, arrived last week.... I just adore it!!... I see it and injoy its beauty every day! Thank you so much!" "The painting is beautiful! I love it! " "Just a quick note to let you know your [miniature] Monet arrived in perfect condition. It looks fabulous!!! Thank you again so much." ------------------------------------------ If you haven't seen the two-DVD set, "The Impressionists", you don't know what you're missing! I rented it from Netflix and absolutely loved it. It is an enactment of the lives of Monet, Renoir, Manet, Cezanne, Degas, and other Impressionist painters living at that time around Paris. Fascinating and eye-opening! Email me at JamieWG@aol.com if interested in this painting. I posted the red oxide underpainting start of this work a few days ago. Today I finished it up in the studio. Hopefully it conveys at least a little of the magic that I feel beside this waterfall below the mountain. It is not an exact depiction of the location, but rather an attempt to capture the essence of the elements that lure me to this spot time after time. Pretty soon the foliage will be in full bloom and the scene will change dramatically, providing an opportunity to capture the vista in its newly-transformed state. $535.00 plus $35 shipping and insurance within the Continental United States. For local sales, shipping charge will be allocated to NYS Sales Tax. Please email me at JamieWG@aol.com for International purchases or with any questions. I stood out on a sand bar off Bannerman Island at low tide to take the photo from which this was painted. I also did a gouache sketch while I was out there on the sand bar. The tide came in before I realized it, and I had to wade back to shore! $295.00 plus $15 shipping and insurance within the Continental United States. For local sales, shipping charge will be allocated to NYS Sales Tax. Please email me at JamieWG@aol.com for International purchases or with any questions. 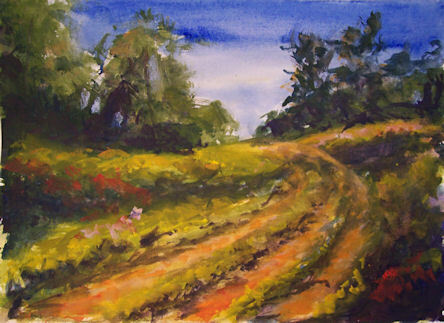 This was painted from a photo taken at the North Salem Open Land Foundation on Baxter Road, one of my favorite places to stroll and paint. SOLD! Please email me at JamieWG@aol.com to inquire about a similar painting. Finished at last! This was such a great painting to work on. Those of you who have been following along may remember that my client for this painting sent me samples of her carpet colors to work into the landscape. They were gorgeous rusts, ochres and muted greens. Selecting a specific color palette is a great way to commission a painting that you know will go with your decor! Here’s a link to the painting’s beginnings, if you’d like to see how I started it. Here is a link to the color/compositon study for the large painting. 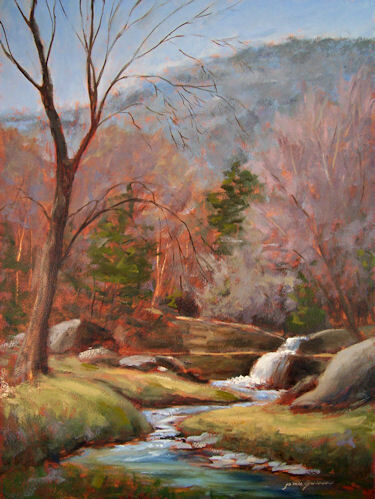 Lastly, here is a link to the plein air painting I did on location. I took my painting gear up on the chair lift! This is a companion painting to Bannerman Archway to the Hudson, which I posted yesterday. 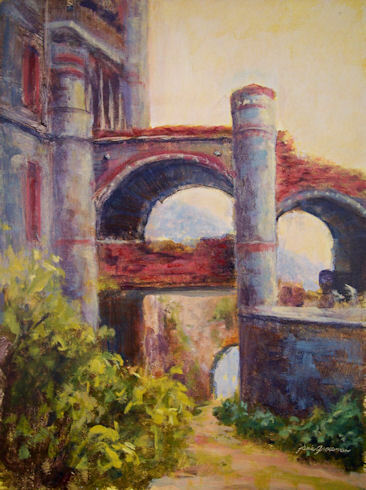 This painting of one of the arches from the famous Bannerman Castle is but a memory of what was. A huge collapse of the castle wall destroyed this magical archway to the Hudson River. I feel so fortunate to have been able to paint there and take photos while much of the structure was still intact. It is my hope that enough money can be raised to strengthen the remaining portions of the structure and preserve whatever is left. 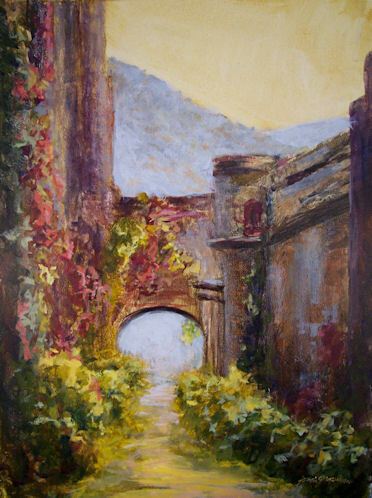 Half the proceeds from the sale of this painting goes to Bannerman Castle Trust for repairs of the castle. 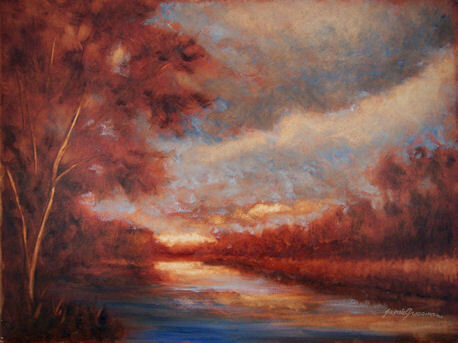 This painting was done from a photograph I took at Titicus Reservoir in North Salem, New York, just as the sun was setting. I was hoping for more spectacular colors, but a big cloud front moved in, providing a different kind of drama that was more about mood and less about color. I used just Transparent Red Oxide, Ultramarine Blue, and Titanium White for this painting. I contemplated putting in more color, but sometimes less is more. I think this was one of those occasions. $160.00 plus $15 shipping and insurance within the Continental United States. For local sales, shipping charge will be allocated to NYS Sales Tax. Please email me at JamieWG@aol.com for International purchases or with any questions. 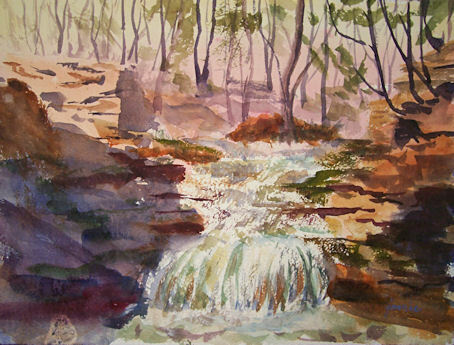 This was my first go at painting this particular waterfall, but it won’t be my last for sure! I had to tiptoe across stepping stones to a little island in the creek to arrive at the ideal vantage point. The painting location was shaded by an overpass while the waterfall was in sunlight, so this will be a fabulous spot on a hot day! There’s been a lot of rain, and combined with the snow melt off South Mountain, the waterfalls were gushing this weekend. 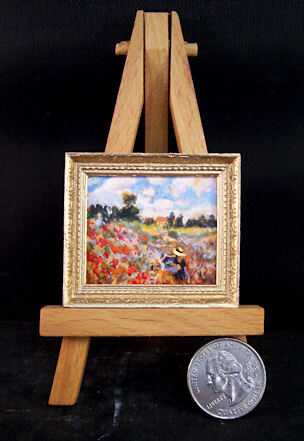 This is the third time I’ve painted this little Monet copy of Red Poppies at Argenteuil in miniature format. I love doing these little jewels! There are a couple more I want to do soon. They’re such a nice change from my larger pieces. I take them as far as I can with just my glasses on, then switch to a lit magnification lens to finish, all with teeny tiny brushes! These miniatures are always sent out in gold gift boxes and make elegant gift items for that special occasion. You can commission a scene of your choosing, a scene from one of my other paintings, or a copy of an Old Master that is no longer under copyright protection. If you’re feeling a sense of deja vu, you’re right! This is an updated version of the painting I posted a couple of days ago. The picnic bench at the park was lopsided. I thought it was kind of cute and put it that way in the painting, but then decided to straighten it out. I also popped the white sailboat in the background. Initially, I liked it subdued, so that it appeared as a surprise when noticed. As I thought about it and looked at the painting, I felt a more prominent boat would make for a better painting. I also added a few more darks in the background and reds in the foreground. I’m leaving the previous version below so that viewers can see the changes I’ve made. Today was absolutely gorgeous. I took the opportunity to finally get out of the studio, and went to paint with some friends at the waterfront park in Hastings-on-Hudson. 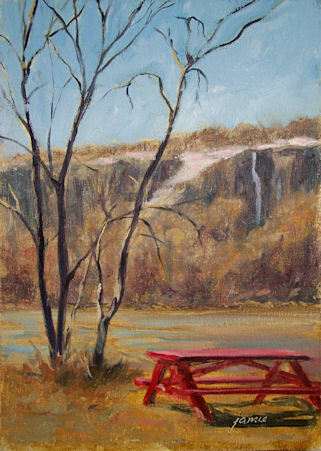 The colors were soft, muted cool and warm tones of spring, so I included the bright red, somewhat-lopsided picnic table to throw a spot of more intense color into the painting. I love the way this palette of colors is working, so I think I might stick with it for awhile. I used only Prussian Blue, Pyrrole Red, and Raw Sienna (plus white of course). Raw sienna was definitely the dominating color of the landscape today, so using that as my only “yellow” played into the scene perfectly. There aren’t any strong greens or yellow-greens in the landscape yet that would require the addition of a stronger yellow. $125.00 plus $10 shipping and insurance within the Continental United States. For local sales, shipping charge will be allocated to NYS Sales Tax. Please email me at JamieWG@aol.com for International purchases or with any questions. This is another painting from the Hastings Waterfront Park — a different bench, different cluster of trees, different section of the Palisades, and different angle from the one I posted yesterday, plus it’s a vertical composition. The colors on my palette, however, remained the same. I’ve gone back into the one I posted yesterday. Tomorrow I’ll post the new version of that one and explain the small changes I made. Stay tuned! $300.00 plus $25 shipping and insurance within the Continental United States. For local sales, shipping charge will be allocated to NYS Sales Tax. Please email me at JamieWG@aol.com for International purchases or with any questions. 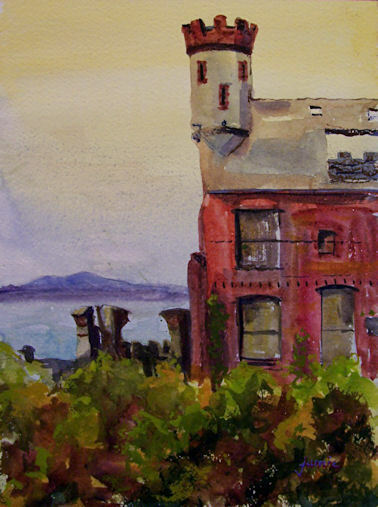 This was painted today from a photo I took on my last visit to Bannerman Island, which was just days before the recent major castle collapse. 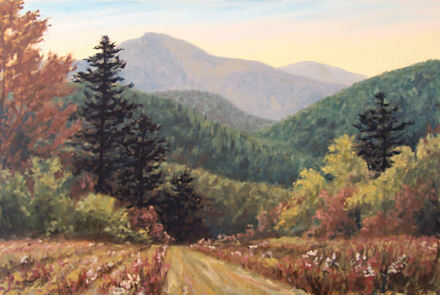 I’m nearing the finish line on this 28×42″ oil painting of a Catskills vista from the top of Hunter Mountain. The colors are actually a bit warmer than they appear in the image above. When I finish the painting, I’ll get a more accurate image of it. You can see how much I’ve done on it by viewing this previously-posted version of the work in progress. and is powered by WordPress.